The CH 53 Stallion came in as a response to the US Marines’ 1962 Heavy Helicopter Experimental competition. The first prototype of the aircraft was introduced to the skies in October 14, 1964. Two years later, the helicopter was well into production and had entered service. From then on, numerous variants of the Sea Stallion were introduced. Among them were the HH-53B and the CH-53E. The former was an aircraft meant for special operations and combat rescue. It had made its mark in history by being one of the most employed helicopters during the Vietnam War. 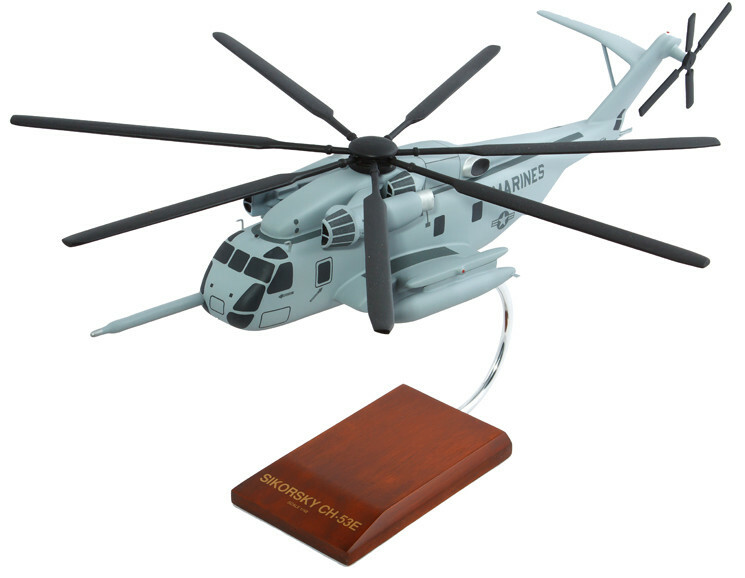 In comparison, the CH-53E was a helicopter that served the US Marine Corps. The aircraft came after the USMC said the CH-53D would not be apt for amphibious assault vessels while the Army’s helicopters were too large for landing ships. Thus, prototype testing for a better Sea Stallion began in the early 1970s. By 1974, the initial YCH-53E was flown. The tests showed that the Stallion helicopter can lift roughly 17.8 tons of weight to an altitude of 50ft, but if without load, test showed that the CH-53 could reach 310 km/h.When mentioning prowess and capability, it’s quite difficult to not mention the Super Sea Stallions. As a proud helicopter that flew during the war for various squadrons, the CH-53 has definitely made a mark difficult to erase. Thus, this wood helicopter model has more than enough reason to warrant a space in your collection shelf. Get this scale model helicopter today!